This video was shot with Lumix GH4 at 4K resolution. 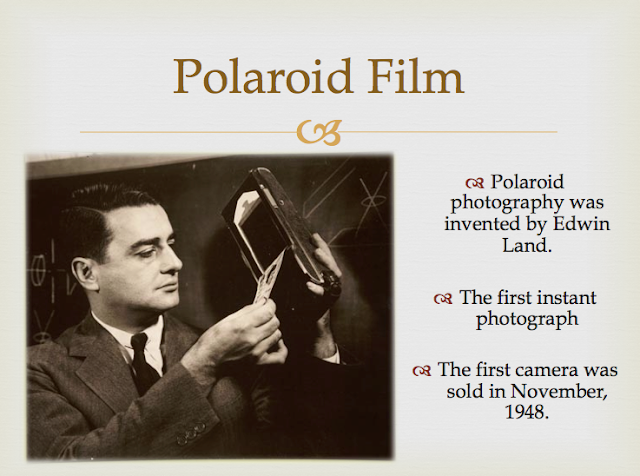 Polaroid is an American brand founded in Cambridge, Massachusetts by Edwin H. Land and his Harvard University physics professor George Wheelwright in 1932. Over the years, Polaroid established a photographic empire that still makes its name synonymous with instant cameras and instant film today. 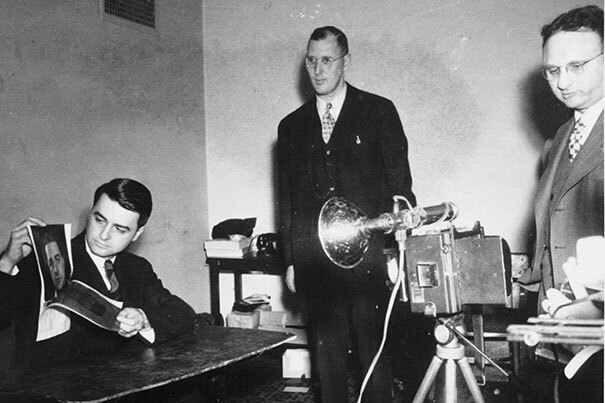 Having studied chemistry for only one year, Edwin Land left Harvard University for New York City where he developed a revolutionary polarizing filter that was not only effective but also inexpensive. Afterward, he returned to Harvard to continue his studies but then left again to establish Land-Wheelwright Laboratories in 1932 in order to commercialize his polarizing filter (primarily for use in sunglasses). In 1937, the company changed its name to the Polaroid Corporation as it looked for further uses for its primary product. As World War II erupted in Europe, Polaroid began working with the US military producing equipment like special camouflage-revealing goggles and targeting systems for bombers. 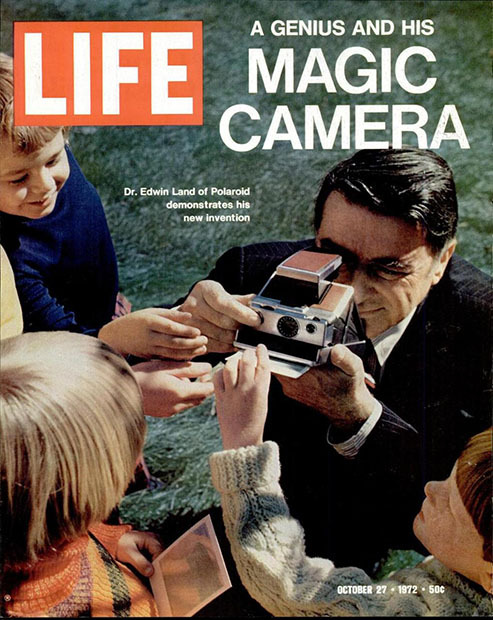 In 1943 while vacationing with his family, Edwin Land began exploring the possibility of instant cameras after his three year-old daughter asks him why she can’t see photographs immediately after they are taken. A few years later in 1947, Land demonstrated instant photography during a meeting held by the Optical Society of America. By November 1948, Polaroid debuted the world’s very first instant camera: the Model 95. Over the next few decades, Polaroid produced millions of different instant cameras with notable models including the fully automatic 100-400 series, the groundbreaking SX-70 folding SLR, the ungainly Big Shot, the compact Spectra (which was also sold as the Minolta Instant Pro), and the ubiquitous OneStep/Pronto! which became one of the best-selling cameras of any type in the United States. Along with consumer models, Polaroid also produced instant products for commercial applications like passport photo cameras and macro cameras for medical and dental work. In 1977, Polaroid attempted to revolutionize home movies with its Polavision instant movie camera system. However, because Polavision film could not record sound and could only be played on proprietary Polavision viewers that produced dark, murky images, it was unpopular and sold poorly. The competition from cassette tape formats like Betamax and VHS also sealed Polavision’s fate as a cataclysmic commercial failure which cost the company over $250 million in today’s money. The fallout was so vast, in fact, that Edwin Land was forced to resign from the company that he had founded. The departure of Land following the Polavision debacle is seen by many to be the beginning of the end for Polaroid. Instant cameras were falling out of fashion with the masses, forcing Polaroid to revamp its market strategies which resulted in factory closures and thousands of layoffs. With the advent of disposable cameras, cheap one-hour 35mm film processing, and eventually digital cameras, the cost-per-image for photography plummeted, making comparatively expensive instant film an increasingly unattractive choice. Polaroid struggled to adapt to a changing market, laying off even more workers and shifting manufacturing to China. After a long series of ultimately doomed products, Polaroid finally filed for bankruptcy in 2001. 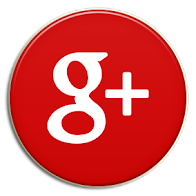 After several years of licensing its brand to other companies, Polaroid was purchased by Petters Group Worldwide. However, the Minnesota-based firm was nothing more than a multi-billion dollar Ponzi scheme and following an investigation by the FBI (which resulted in 50 year prison sentence for the firm’s CEO), Polaroid announced that it would no longer manufacture instant film and declared bankruptcy once more in 2008. After Polaroid instant film production stopped, a Dutch company called The Impossible Project purchased production machinery and leased a former Polaroid factory in Enschede, Netherlands to continue manufacturing Polaroid instant films and other related products. Meanwhile, Polaroid was again auctioned off in 2009, this time to Toronto-based Hilco Consumer Capital LP and Boston-based Gordon Brothers Brands LLC. This led to a revival of sorts for Polaroid as it desperately fought to become relevant again, even going so far as to name eccentric recording artist Lady Gaga as its creative director in 2010, a questionable arrangement that unceremoniously fell apart in 2014. Polaroid continues to license its name, having entered into an agreement with Summit Global Group to sell Polaroid-branded digital cameras and other photographic products. Interested in starting or growing your own collection of Polaroid cameras? McKeown, James M. and Joan C. McKeown’s Price Guide to Antique and Classic Cameras, 2001-2002. (Grantsburg, USA: Centennial Photo Service, 2001), 542-546. The Pirelli 2018 Calendar by Tim Walker was presented at the Manhattan Center in New York. For the 45th Calendar edition, shot in London last May, the British photographer applied his unmistakable style of extravagant sets and romantic motifs, to revisit one of the classic stories of British literature: "Alice’s Adventures in Wonderland". His inspiration came not only from Lewis Carroll’s fantastic story, but most importantly from the illustrations that Carroll himself had entrusted to John Tenniel for the first edition of 1865. In Tim Walker’s 2018 Pirelli Calendar they become 28 shots consisting of 20 different and extraordinary sets for a new unique Wonderland. In order to convey his idea of Alice’s Adventures in Wonderland, Walker has portrayed a cast of 18 personalities, both established and upcoming, including musicians, actors, models, and political activists. 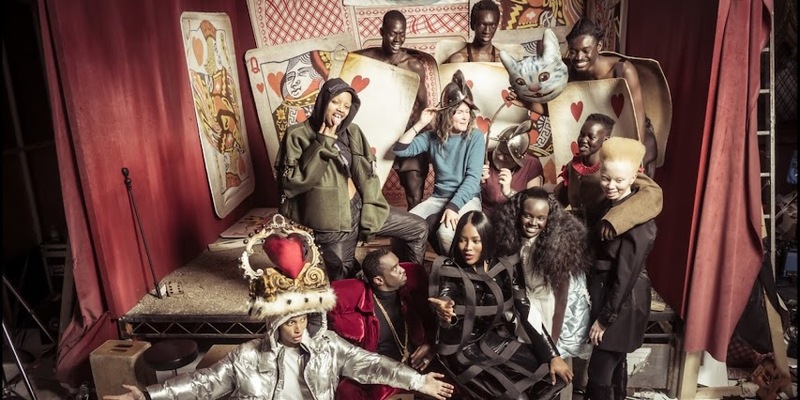 It features Sudanese-Australian model Adut Akech, Ghanaian-British fashion model and feminist activist Adwoa Aboah, Senegalese-German model Alpha Dia, Beninese-American actor and model Djimon Hounsou, South Sudanese-Australian model Duckie Thot, Gambian women’s rights activist Jaha Dukureh, British model King Owusu, American rapper and singer Lil Yachty, Mexican-Kenyan actress Lupita Nyong’o, British supermodel and actress Naomi Campbell, American actor, television personality and singer/songwriter RuPaul, American actress Sasha Lane, American rapper, singer, songwriter, actor, record producer and entrepreneur Sean “Diddy” Combs, American model Slick Woods, South African model and lawyer Thando Hopa, American actress, comedian, author and television host Whoopi Goldberg, British model Wilson Oryema and British fashion stylist, designer and singer Zoe Bedeaux. Eye of the Storm is a winter saga in Iceland. In Iceland there are many kinds of storms. Ice, snow, rain, sand, ash, solar, magnetic, and more. Storms are agents of change. While often destructive and unpredictable, they also demonstrate the unyielding power of nature. They reveal nature's beauty and its hand in creating the landscapes we see today. Shot in Iceland between February and March, 2014, I was lucky enough to witness and film the power of an X-class solar flare and coronal mass ejection hitting our atmosphere. The resulting auroras were a sight hard to believe, even in person and seeing it with my very own eyes. Enjoy the film! Shot on the Canon 1-DC and 5D Mk III in 5K raw. Motion control using Kessler Crane Cinedrive, Shuttlepod Mini, Turntable and Oracle. Edited and available in Cinema 4K and Ultra HD. Exceptional events require an uncommon sort of picture taker, and few events are more unique than your big day. You do, all things considered, just get one of them (well, that is the thought in any case) thus the picture taker needs to catch everything without exception as superbly as conceivable so as to safeguard your ideal day. It's a major obligation, and as should be obvious, a few people consider that duty important undoubtedly! Gathered by Bored Panda, this in the background take a gander at the universe of wedding photography uncovers the diligent work and devotion that goes into taking the ideal wedding picture.